The rapid growth of ridesharing has become widely accepted by people all over the US. With the convenience of mobiles apps like Uber and Lyft, as well as online booking from sites such as carpooling.com or Ridester, it is safe to say that ridesharing has become an important part of everybody’s daily commute. But exactly how safe is ridesharing in the US? Throughout our childhood, it has been stressed to “never talk to strangers”. There have been dangers in hitchhiking, for both the driver and passenger, since they would be in the presence of a complete stranger. Although hitchhiking has been a thing of the past, the concept of ridesharing shares a similar danger. As simple as it is to book a ride through mobile apps, or going online to find rides with Ridester, there is always that lingering fear for one’s safety in the ridesharing business. Thankfully, there are companies, like Zendrive, that hope to take away those fears. Zendrive is a company that focuses on data capturing and analysis using the driver’s smartphone. They provide a safety benchmark for fleets of drivers all around the US. They take in data which include sudden braking, speeding, aggressive driving, and unusual driving patterns due to mobile phone use. This data is studied and compared to times of the day, and days of the week, for each city. The data taken and analyzed from thousands of samples were then studied to give the city an idea as to which hours are the best ones to take a ride. Companies, like Zendrive, also allow integration of the different ridesharing apps, so that the ridesharing fleet can be closely monitored. In the case of possible collisions, the emergency contact is immediately notified so that they can call for help immediately. What cities are considered safest? From the studies made, it is shown that the safest cities for ridesharing in the US are San Diego, Portland, Austin, and San Francisco. Meanwhile, the least safe ridesharing cities are Dallas, Miami, Houston, Fort Worth, and Atlanta. The safety benchmark was used to determine the safety indices of the cities. What time are trips most dangerous? As observed in the time and day analysis, it has been shown that most of the dangerous trips happen around 8 am on a weekend, while afternoons (around 1 pm) for the weekdays. Late night trips that occur from 9 pm to midnight are considered to be the safest. Although results have been much unexpected, it is observed that during the stated “dangerous” hours, a huge fraction of the drivers is distracted, often with their mobile phones. It is through analytics and data statistics like these that fleet managers can find options to further improve safe driving practices. They can also use these data to improve trainings to increase the reliability of the drivers that they hire. 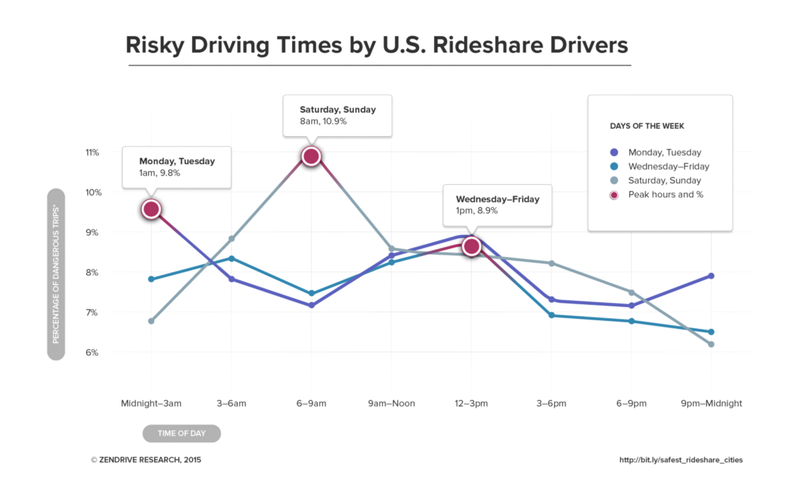 Ridesharing is still a growing industry, so there still is a lot of room for improvement. It definitely still is a service worth trying out and keeping an eye for the latest news on rideshare.